“Men don’t think they do it, but they do,” explains Amanda Ritchart, a linguistics grad student at UCSD. A coffee shop barista asks a person for his or her name. The person says their name almost as if it were a question (Mike?, Isabelle? ), even though we know that this person is not actually questioning his or her name. Although it’s associated with the caricature of valley girls (as seen in the 1995 movie Clueless), some linguists date it to the 1950s, while others argue it is centuries old. Use a map to give directions to a listener. When giving directions, a non-uptalker would use a declarative sentence, without a rising inflection. 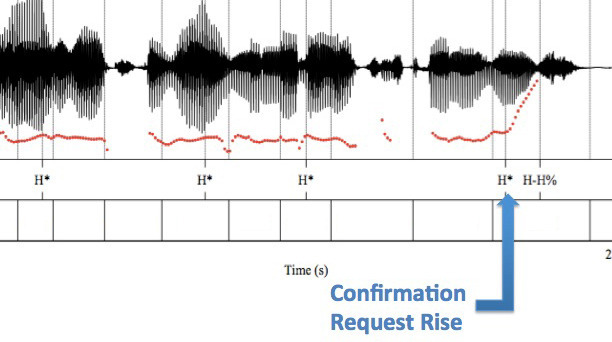 But uptalkers did use rises, as if they were implicitly asking the listener to confirm that they were being understood: “Go all the way to the right in the middle where it says Canyon Hills?” Both the men and women in the study used uptalk 100 percent of the time in these so-called “confirming” statements. It’s easy to dismiss uptalk as the language of airheads, but in fact, it appears that it can be quite useful. *11 male and 12 female. 15 monolingual and 8 bilingual. 12 self-identified as Asian, six as Hispanic, 5 as White. Using the MacArthur Scale, the speakers were grouped into socioeconomic status classes: Lower (4), Middle (13), and Upper (6).